Il Mausoleo di S.Costanza was built by order of Costanze, daughter of Emperor Constantine, to be near the martyred Sant'Agnese. Costanza and her sister Elena are buried here. We were enraptured on entering this spectacular circular building. The narrow brick walls and twelve twin columns surrounding the center altar create a stunning visual impact. The arches between the columns have beautifully preserved 4th century mosaics and the ceilings and walls are decorated with ancient frescoes. At Giorgio's suggestion we headed south to Via Livorno 8-10, just off Piazza Bologna, to Oriental Food for kosher middle eastern delights. We had excellent traditional renditions of bruschetta israeliana (thin focaccia with olive oil and herbs), hummus, tahina, babaganoush, falafel and chopped vegetable salad. Returning, we walked along Via Nomentana past the lovely grounds of Villa Paganini and Villa Toriona to Viale Regina Margherita and then northward. Santa Maria Addolorata a Piazza Buenos Aires (Our Lady of Sorrows at Piazza Buenos Aires), the Argentinean National Church, 81 Viale Regina Margherita, is dedicated to the Blessed Virgin Mary. 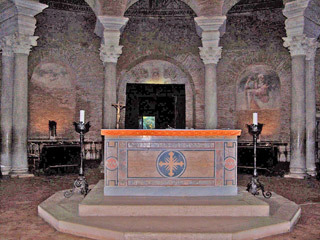 The church was founded by the Argentinean priest Msgr. José León Gallardo. Construction started July 9, 1910, the centenary of Argentinean independence, and inaugurated in 1930. Argentina was the first Latin American country to have a national church in Rome. The two story façade is built in the style of ancient Christian architecture. In the centre in striking dark green and gold is a depiction of the Lamb and symbols of the four Evangelists. There are also depictions of four palms symbolizing Paradise, the four biblical rivers and symbols of the twelve Apostles. The attractive 7 story campanile was built at the same time as the church. Adjacent to the church is also the community of the Argentinean diocesan priests who serve the church. The church is built in a Roman-Byzantine style, with three aisles divided by Ionic columns. The geometric patterned marble floor has an Argentine coat-of-arms in the center. Theres a good shopping strip along Viale Regina Margherita from Via Nomentana to where Margherita becomes Viale Liegi. Enough culture for the day, back to the Hotel Delle Muse to meet our old friend Moshe from Israel, who was staying overnight before catching a morning flight. One of the advantages of staying in Parioli is that within 15 minutes we are able to reach the Borghese Gardens, stroll through the beautiful environment and be at any city center destination within 30-40 minutes. Today we walked through the center to Piazzale Flaminio and browsed the small open market before passing through Porta del Popolo into the imposing large oval Piazza del Popolo. In the center of the square is an Egyptian Obelisk that was moved here from Circus Maximus in 1589. It's about 75 feet high and was originally built in 1300BC to commemorate the conquest of Egypt. The square was redesigned in the early 1900s by adding walls around the perimeter creating the existing oval shape. Four Egyptian lions were added around the obelisk as well as a central fountain. Four streets run south from Piazza del Popolo, Via Margutta, Via del Babuino, Via del Corso and Via di Ripetta. Across from each other on Via del Corso, the major street running through the heart of old Roma to Piazza Venezia, are two symmetrical churches. The churches, the Santa Maria dei Miracoli and the Santa Maria in Montesanto, were designed by Carlo Rainaldi. The churches are not identical since the surface area for the Santa Maria in Montesanto (on the left) was smaller. In order to preserve symmetry, he created an oval dome for this church and a circular dome for the Santa Maria dei Miracoli. We just love standing in the center of this square and doing a 360? (not to be confused with the bus #360) marveling at the impact of the design. It's a fabulous spot for people-watching. Via Margutta is sort of tucked away and many miss this charming, narrow street filled with art, sculpture, antiques, fine furnishings and fashion housed in precious ancient buildings. 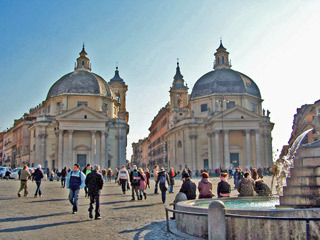 When in Piazza del Popolo, check it out. We headed over to Via Ripetta, then south in the direction of Giolitti for a gelato lunch. At Piazza Porto di Ripetta a well dressed gentlemen in a nice car stopped us to ask directions to the Vatican claiming he was from Milan and lost. We showed him the way on his map while he proceeded to tell us he was the Sales Director for Calvin Klein and that because we were so nice and since he had samples of leather jackets with him he would like Linda to have one. He took a package from the rear seat that looked like a beauty and held it out to us. He reached behind the seat of his car again and brought out another winner for me. It's a good thing we always try to stay up-to-date on the reported scams; bells began to go off. He started handing us the goodies and at the same time asked if we could give him money for gas because he forgot to stop at the bank. We told him we were not interested in the jackets (undoubtedly plastic) under any circumstances. He put the car in gear and roared away. Take care folks! Feeling proud of ourselves for avoiding the scam we tried some new flavors at Giolitti and we were deliciously rewarded. Linda is now addicted to orange and I to coffee. We checked out a few restaurants for future consideration in the area west of Piazza Navona. One of our favorite streets where it is easy to spend time admiring the ancient buildings and artistic shops is the narrow Via dei Coronari. Eventually we got to read the menus and give the sniff test to three candidates. Everyone we meet has at least three eating places to recommend; it's a tough assignment to sort them all out. After this long day of walking we decided to take the bus from Corso Vittorio Emanuele to Termini and get the #360 to Piazza Delle Muse. Ristorante Pagaroma at Viale Bruno Buozze 31/33 is about a 15-20 minute walk from the hotel not far from Piazza Ungheria. The environment is smart casual with a neighborhood attitude. The clients seemed to be regulars as the staff welcomed them back and greeted them by name. The house offered prosecco and thin focaccia with olive oil while we read the menu. We started with a large delicious Carciofi alla romana (simmered in olive oil). I had one of the daily specials, stinco di vitello al forno con pure de patate. The slices of veal were nice quality but over-salted; the mashed potatoes were just fine. Linda's entrecote di manzo danese was thick, chewy and tasteless; the roast potatoes were just okay. We noticed that most of the other diners had ordered fish dishes which looked quite good. Fish may be the thing to eat here but why offer an extensive meat menu, unless you can do it well. This morning we hit every shop on Via Del Corso featuring SALDI, bringing the number of jacket try-ons up to 265. The streets and stores were quite busy with shoppers snapping up the last of winters fashion bargains. I was getting concerned that Linda's "gem" did not exist. We found a special lunch spot so all was not lost. At the Fiumi Tevere end of Via Coronari is Via dei Banchi Nuovi and at number 4 is the tiny Alfredo & Ada where Ada and her friends serve old Roman recipes in an ancient environment. No big decisions are necessary. The fixed price of 18 euro per person includes primo, secondo, bread, wine, water and dessert. 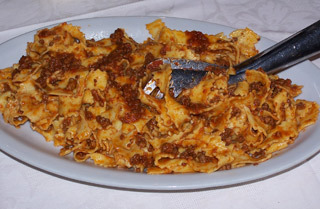 Today the pasta was an elbow variety with tomato, pork and pepperoncini, sprinkled with grated cheese. 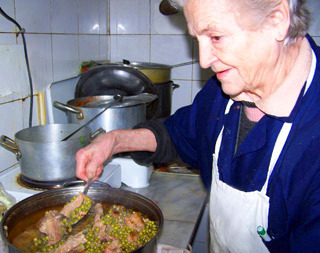 There were three secondi from which to choose; boiled veal with spinach and peas, brasciola with mixed veggies and sliced roasted veal with fava beans. We opted for the brasciola and the roasted veal and the sweet ladies did not want us to leave hungry so they brought a dish of sliced sausage for us to try. Dolci was as many delicious cookies as we wanted. They are only open for lunch; find your way there for an authentic Roman experience. The big search continued up and down Via Nazionale and along Corso Vittorio Emanuele with the try-on count mounting to 358. This exhausting work lasted into the early evening when we found our way to another new (for us) restaurant, Trattoria Settimio Pellegrino at Via del Pellegrino 117, telephone 06-68801978. 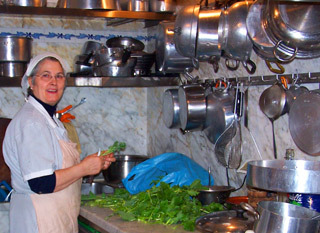 The door to this very popular small trattoria is kept locked, so ring the bell. Mario and Teresa, husband and wife, are the owners. Teresa is the chef and Mario handles the front. The staff is very friendly and welcoming (including the two sons, lawyer and doctor, who pop in occasionally to help out). The menu changes daily with a limited number of traditional Roman dishes at very reasonable prices. It's a casual place where eating well at a leisurely pace is encouraged. We started with pasta, spaghetti with plain tomato sauce and fresh tuna was added to mine. Linda so enjoyed her grilled meat balls (actually two thick hamburgers) that she couldn't wait to return. I have never had such fresh, well prepared cuttlefish, simply cooked with tomato and olive oil. Fresh brocoletti and sliced boiled potatoes were a delight. Italy has finally banned smoking in restaurants, cafes, bars, and on public transportation which people seem to have accepted as a necessary reality. However it appears it has not done much to stop the smoking addiction. Smoking is allowed on outdoor patios so in the good weather there is a fog outside these places. Folks dash outside between courses to inhale a few drags. There is as much smoking on the streets as there is cell phone use. The sidewalks and gutters are filled with spent cigarettes. Young adults of both sexes seem to be the heaviest smokers. I sure hope they get message soon: smoking kills. Many years ago we brought our friends some olive oil from the Agriturismo Belagaggio in Montefollonico, which they loved. We got a call from them suggesting we go there for lunch and get some more of the nectar. Ada and Antonella (mother and daughter respectively) had prepared some spectacular meals for us during our stay there, and it would be a treat to see them again and share their table. We called to be sure the family would be there and they were as happy to have us as we were to be going. On the way we drove through the hilly, long, narrow streets of Citta Della Pieve where the high brick and stone buildings have been beautifully restored. We planned to walk around a bit but it was difficult finding parking and it began to rain so we headed to Montefollonico to the warm dry comfort of Belagaggio. It had been almost five years since we were there and it was good to see the additions and improvements to the property. It was the first visit for our friends and they were very impressed with the quality and style of the agriturismo. We had been there off season in 2001 and had taken our meals with the family in their cucina. This time they proudly welcomed us into the new ristorante with the fireplace aglow, warming the charming Tuscan room. We started with platters of my favorite cheese, pecorino, both hard and soft, prosciutto and salami. These local treats have to be eaten with lots of bread and homemade red wine, and so it was. Last time we had joined the ladies before meal time to watch them roll out and cut the pasta on the kitchen table so we knew the pasta would be special. Today the wide noodles had jagged edges which allowed the deer ragú to cling to every mouthful for perfectly-balanced flavor and texture (do I get carried away or what?). Luscious deer stew with porcini mushrooms was set before us, an excuse for eating more of the delicious bread. One must never pass up homemade crogetti and cenci, fried thin dough sprinkled with powdered sugar, and a donut-like beauty with a honey glaze, as dolci. Home brewed vin santo and coffee completed this fabulous meal. Belagaggio is set into the rolling Tuscan hills; accommodations are authentic Tuscan with all the necessities for an extremely comfortable stay. The view from the swimming pool area is stupendous. We said our fond goodbyes with the tastes of lunch still lingering and the rear of the car filled with bottles of Belagaggio's own olive oil. Arriving back at the hotel in the early evening, we rested a bit and walked over to via Parioli, 93 (10 minutes) to La Maremma for very good pizza. They do it two ways, traditional thin crust and a softer, thicker Napoli style for an additional charge (our choice). This pizza is not as good as it is in Napoli - not even close - but its pretty darn good. Sun, blue sky - let's walk to the Termini station area to visit two of the four Archeologica di Roma of the Museo Nazionale Romano. It's a fun walk past residential areas, street markets (an opportunity to test your bargaining skills), interesting shops, tempting food choices and street life. I must point out that walking in Roma is a challenge. Cars, motorcycles and scooters have no regard for human life, particularly at signal-free pedestrian crossings. Where there are lights, always remember that drivers consider red lights to be suggestions. You must be agile, alert and try to cross with the crowds. Another impediment is that you must also keep your eyes down to avoid dressing your shoes with dog droppings. Eyes down, eyes up, a few prayers and you'll do just fine. Of course there is also the problem of finding space to cross the street, since vehicles park against each other in every conceivable inch of space. Blocking crossing points is probably rewarded with a medal of honor.